Colorado has more than its share of stunning natural attractions, but sometimes the kids are eager for a little more than mountain vistas and scenic drives. We’re happy to oblige with attractions for the whole family in every region of the state. Here are a few suggestions for kids 10 and under — from children’s museums and zoos to hot-springs pools, tubing hills and wildlife experiences. For even more, visit COLORADO.com/attractions. • Children’s Museum of Denver: Learn about the world in the museum’s child-sized grocery market, fire station and construction workshop. 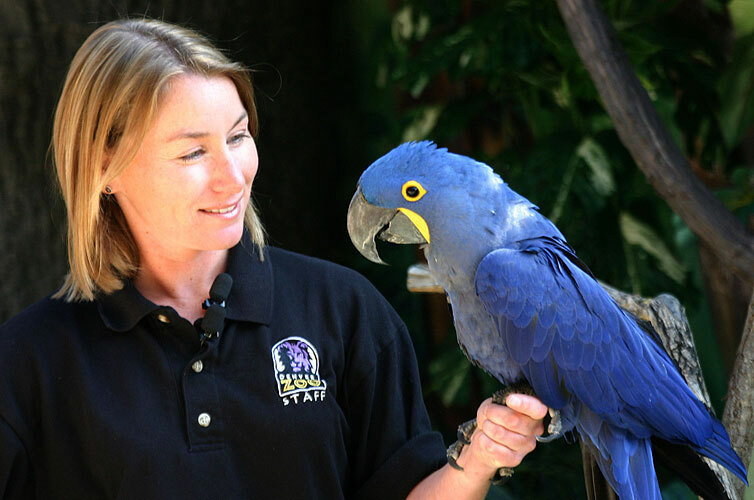 • Denver Zoo: See the more than 3,500 animals that call the 80-acre zoo home. Monkey Island and the big cats exhibits are among the top crowd pleasers. • Downtown Aquarium, Denver: Feed a slippery stingray and gaze at hypnotically moving jellyfish, stealthy sharks and frisky fish of every color. • Butterfly Pavilion and Insect Center, Broomfield: Walk through a tropical rainforest habitat filled with free-flying butterflies. Sniff exotic plants, pet a sea star and hold a tarantula. • Denver Museum of Nature & Science: Watch an out-of-this-world show at the planetarium and IMAX theater. Tour exhibits about space, gems and minerals, dinosaurs and the human body. • Denver Art Museum: Explore, learn and play. Get creative with hands-on activities for all ages, relax in one of the family fun areas and discover world-class art. • Colorado Railroad Museum, Golden: Stroll the museum's 15-acre railyard featuring more than 100 railcars — come Saturdays for the train rides! • Wings Over the Rockies Air & Space Museum, Denver: See dozens of historic airplanes, space vehicles and interactive exhibits. The collection includes a rare B-18A Bolo–one of only five remaining WWII-era bombers–five Century-Series fighters. • Fort Collins Museum of Discovery: Kids love the blend of science, history and cluture at this hands-on experience in Fort Collins. • The Wild Animal Sanctuary about 45 minutes from Denver amazes visitors with its Mile Into the Wild walkway that lets you observe lions, wolves, grizzlies and other rescued exotic and endangered species from above. • Pottery painting: Pick a piece of pottery at Color Me Mine in Boulder and Crackpots in Longmont. Make it your very own with paints and stencils. • Colorado Model Railroad Museum: Examine intricate model railroad layouts, a wooden caboose from the Colorado and Southern Railroad and more than 1,000 railroad artifacts. See actual trains come and go on nearby tracks. • Hot-springs pools: Splash around and soak up the mineral waters year-round at Indian Hot Springs in Idaho Springs, Glenwood Hot Springs Pool, Strawberry Hot Springs in Steamboat Springs and Hot Sulphur Springs Resort & Spa. • Summer fun parks: Sample the activities at mountain-top parks with alpine slides, mini-golf, bungee rides, climbing walls and more in Breckenridge, Copper Mountain, Steamboat Springs, Vail and Winter Park. There’s also Glenwood Caverns Adventure Park in Glenwood Springs and Bananas Fun Park in Grand Junction. • Mountain Top Children’s Museum, Breckenridge: Become a fireman in the costume studio, create a masterpiece at the Creation Station and make wildlife tracks in the wildlife exhibit. • Summer Tubing Hill in Granby: This is the first-of-its-kind in Colorado and only the third in the U.S. Take winter tubes for a thrilling ride down the simulated snow surface, then ride the magic carpet to the top and do it again. • Epic Discovery at Vail and Breckenridge: Immerse yourself in nature, challenge yourself with thrilling activities like mountain coasters, zipline tours, adventure courses and much more. • Rocky Mountain Wildlife Park, Pagosa Springs: Peer into habitats of animals native to the area, including black bears, wolves, elk, mountain lions, bobcats and coyotes. • Crested Butte Mountain Resort Adventure Park: Take on the climbing wall, bungee trampolines and an 18-hole mini golf course in summer. In winter, soar around the ice-skating rink and down the lift-served tubing hill. • The Trailhead Discovery Museum and Arts Center, Crested Butte: Explore the play park, art and science activities, a puppet theater and a Dig Pit, with trucks, funnels and shovels. • Trimble Hot Springs in Durango, Ouray Hot Springs Pool in Ouray and The Springs Resort & Spa in Pagosa Springs: Swim year-round in natural hot springs. • Museum of the Mountain West, Montrose: The Old West comes alive at this gem packed with fascinating artifacts housed in restored historic buildings, including a saloon and doctor’s office. • Telluride Ski Resort’s Eco Adventures program allows kiddos ages 5–12 to participate in half- or full-day camps designed to connect them with the surrounding environment. • Durango & Silverton Narrow Gauge Railroad and Museum: Climb aboard a vintage steam locomotive that has been carrying passengers along the scenic Animas River from Durango to Silverton since 1882. • Cave of the Winds, Manitou Springs: Travel through more than two miles of underground limestone passageways on well-lit, easy tours into the cave’s twists and turns. • Cheyenne Mountain Zoo, Colorado Springs: See nearly 800 animals — from endangered Amur tigers to moose and mountain lions — in a mountain setting that makes this one of the most unique zoos you’ll encounter. • North Pole Home of Santa’s Workshop, Cascade: Never lose that holiday feeling with special visits from Santa, magic shows, the Candy Cane coaster and more than 20 other rides. (Open mid-May–December 24). • Rocky Mountain Dinosaur Resource Center, Woodland Park: See displays of dinosaurs, prehistoric marine reptiles and fish from the late Cretaceous period; learn the stories of their discoveries and see a working fossil lab. • Royal Gorge Dinosaur Experience, Cañon City: Explore full-scale dinosaur fossil casts, hands-on exhibits, animitronic dinosaurs and more. • Cripple Creek & Victor Narrow Gauge Railroad, Cripple Creek: Embark on a 45-minute ride in an old steam engine through past historic mines to the boomtown days of Cripple Creek and Victor. • Captain Zipline Adventure Tours, Salida: Swing, walk tightropes, scale cliffs and more at Colorado’s largest aerial adventure park, featuring courses for all ages and abilities. • Sand sledding and boarding: The young and young at heart love to slide down the soft sands at Grand Sand Dunes National Park and Preserve near Alamosa. • Buell Children’s Museum, Pueblo: Play in the colorful hands-on exhibits, arts-and-crafts studio and a baby-barn-animal-themed space for kids under 4. • Pueblo Zoo in City Park: Meet red kangaroos, white-handed gibbons and zebras, and visit an eco-center with exotic birds, penguins and reptiles. • Bent’s Old Fort National Historic Site, near La Junta: Enter a living museum, where costume-clad guides lead you through a trading outpost once frequented by legendry Kit Carson. • The Nature & Raptor Center, Pueblo: Stroll dozens of miles of trails that are home to hundreds of birds of prey along the Arkansas River. • Old Fire House No. 1 Children’s Museum, Trinidad: Sound the alarm, climb atop an old fire truck and play dress up in this converted firehouse. • Kit Carson County Carousel, Burlington: Take a spin on the nostalgic carousel. Built in 1905, the wooden animals are all original and hand painted. • Burlington’s Old Town Museum, Burlington: See what life was like 100 years ago in this re-created prairie town with an old-timey soda fountain, horse-drawn carriage rides and more. • Overland Trail Museum, Sterling: Hear tales of Colorado’s earliest settlers in the period village’s blacksmith and barber shops, one-room schoolhouse and general store. Check out farm and ranch activities, museums, trains, rodeos and state and national parks. Photo courtesy of Denver Zoo/Dave Parsons.